After getting their butts kicked last weekend in Silver Star, the AWCA senior skiers stepped up in a big way in Rossland, BC. Olivia Bouffard-Nesbitt, Julian Locke and Jack Carlyle brought great performances, much to the delight of coach Scott Perras. “For everyone it was a sign they are moving in the right direction. It shows the plan has purpose and our racers are learning to perform. Some are getting rewarded with results, and some are still looking. Bouffard-Nesbitt kicked off the medal parade Friday (Dec. 16) with a bronze medal in the the 10 km skate with a time of 32:05. She was the top Canadian, as American Chelsea Little was untouchable with her time of 29:37.8. She followed that up with a silver medal in the open women’s skate race saturday, narrowly missing gold behind American Erica Flowers. 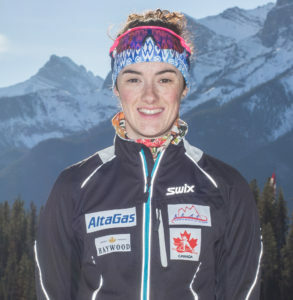 Bouffard-Nesbitt finished her weekend with a fifth place finish in the interval start classic race, which placed her in third overall on the weekend. Bouffard-Nesbitt is still bouncing back from stress fracture injuries which robbed her of weeks of training, so the AWCA coaches are scaling back her training this week. “Her plan is a bit different. She had a bit more rest coming into the season, and now is time to sit back and realize how well it went,” Perras said. Fresh off the plane from Norway, Jack Carlyle literally rushed from the airport and into a race bib in Rossland. 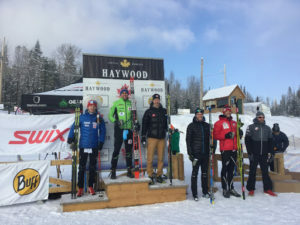 He began the weekend with a fifth place finish in the 15 km skate, gutted his way into the heats in Saturday’s sprint, and took silver in Sunday’s classic 15 km race. “Jack threw down some big races. These were definitely some of his best results on the NorAms. He came back from Europe, where he saw the pace over there, and it translated into performance,” Perras said. Racing on his home course and returning from injury, sprint specialist Locke’s incredible power was on display in the sprint. He finished second to American Andy Newell, who was 36th the week before on the World cup. “Julian looked good. It’s easy to see his race IQ and interesting to see his mindset. He is ready to take lines when they appear on the sprint course, where it is easy to be timid,” Perras said. Injuries haven’t derailed the talented sprinter, and Locke will contend for a spot on Canada’s World Championship team. Patrick Stewart-Jones and Maya MacIsaac-Jones also returned from injury to race, and Perras said their form is still coming. They will see their training volume ramp up as they rediscover their racing fitness. Both had massive smiles and were happy to simply race once again. Dominique Moncion-Groulx and Dephine Duvarnay Tardiff also raced well, and picked up valuable experience racing with the top athletes. The team will have a small holiday break and return with a Lake Louise Training Camp on Dec. 27.